Yellow-billed Cuckoo with Caterpillar. Moku Hanga Proof by Ken Januski. 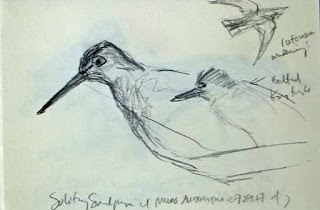 Three artistic subjects have been on my mind over the last few weeks: field sketches, shorebirds and moku hanga prints. And to a lesser extent, the annual exhibition of The Society of Wildlife Artists in London, UK. All of these subjects relate to the idea of artistic motivation, specifically MY artistic motivation. I mention this because I think that unless you're an artist you might not realize that artists have motivations. They don't just make art the way you the viewer think art should be made. My own motivations are often complex if not contradictory. For one thing I love sketching birds from life, though with a caveat or two! 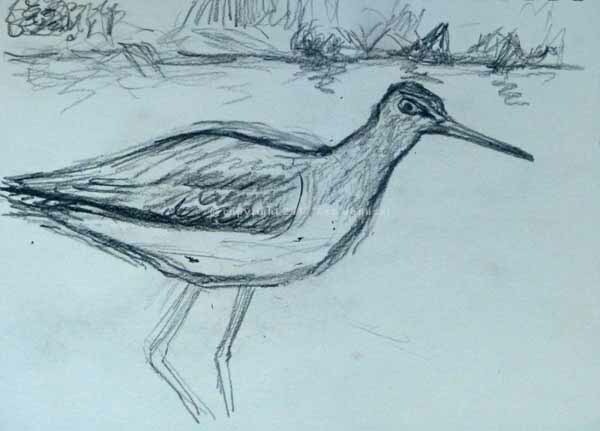 I particularly like sketching shorebirds and there's one primary reason for that: I can see them. I can even see the whole bird! That is not true with warblers, vireos, flycatcher, sparrows, etc. Most of them are hard to see period because they are moving so quickly and in addition they are often partially obscured by their environment, often vegetation. 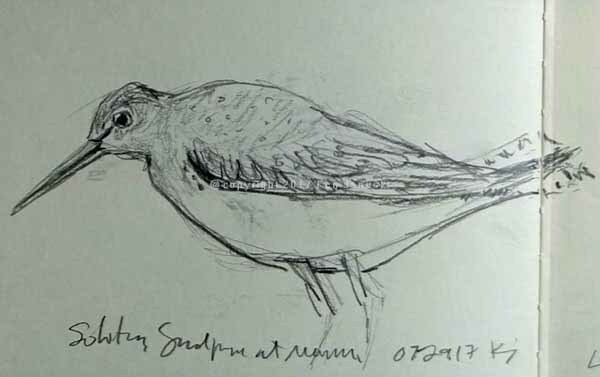 What a relief it is to go from a fast flitting warbler seen only briefly and partially through some leaves to a shorebird that sits out in front of you, often staying in the same area, if not same position, long enough for you to look through your spotting scope, see, and sketch some detail. So that is why it was particularly exciting a couple of weeks ago to find a fair number of species of shorebirds at Morris Arboretum. I spent a good part of two days sketching them. They didn't sit quite as still as I've just indicated that they often do. In fact they rarely sat still. But they did remain out in the open so it was possible to get continued looks at them and build up a drawing over time, adding little touches of areas I missed earlier in the sketching. 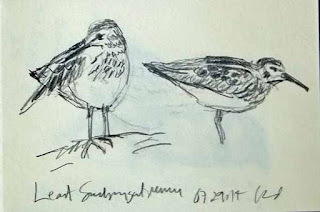 As you can see I kept quite busy with both Least and Solitary Sandpipers. But why? Given that my work normally ends up being somewhat abstract or stylized why spend so much time sketching birds from life? I'm not an illustrator whose job it might be to capture them realistically for a guide book or something similar. Well it's a good question. For me I think there are a couple of answers. One is that the more I sketch them the more I understand their structure and the more confident I am in using them even in the most abstract form. I know that there is a basis in reality. The second, which I just figured out today is the challenge. 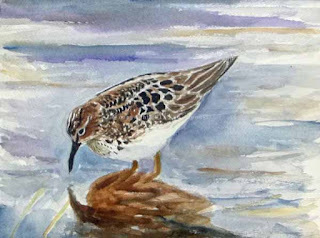 Birds, especially shorebirds have subtle but elegant shapes. It is a real challenge to both see and put down on paper all that is in a shorebird, especially in regard to shape. This reminds me of figure drawing in a way. The subject is endlessly complex, challenging and rewarding. And as with figure drawing there is also an almost sculptural aspect, the desire to show movement and how weight is distributed. It almost entails a physical empathy with the bird, animal or model. Work that shows this, even when incredibly detailed, immediately attracts me. There is a real excitement in both trying to see what is there and in trying to get it down on paper. I'm showing quite a lot of photos of field sketches here. Some are better than others. But I think most if not all capture the excitement of drawing birds in the field. 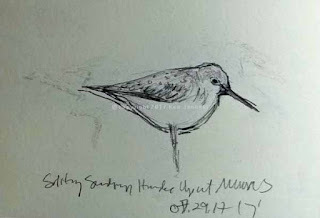 (Though I rarely sketch animals I expect that the challenge and reward is similar). Least Sandpiper. 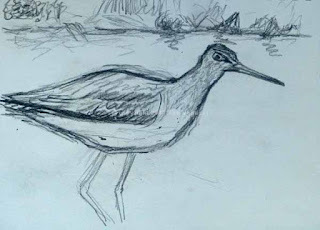 Field Sketch by Ken Januski. Solitary Sandpiper. Field Sketch by Ken Januski. 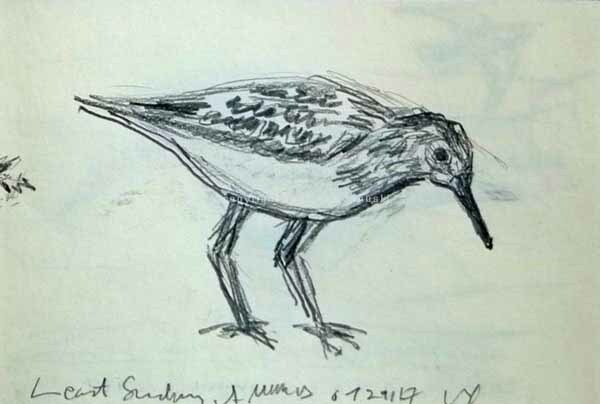 Solitary Sandpiper.Field Sketch by Ken Januski. .... this is only one artistic motivation. There is also the one of artistic composition, which includes color, shape, texture, etc. In many ways it is more exciting to me. It is this motivation that I think non-artists are most unaware of. It is the thing, or at least one of them, that makes art Art. It is both the motivation behind the moku hanga print at the top of this post and the motivation behind the prints that I selected for my application to this year's annual exhibition of The Society of Wildlife Artists. In fact it's really more than composition. It's more like personal expression and all that this entails, often a great deal of concern with composition. So it explains the endless proofing I've done on the Yellow-billed Cuckoo print in order to get it to meet some subconscious sense I have of what is right and it explains why I chose the particular prints I did for the SWLA show. And in fact both works turned out to be rejected. This rejection was a bit of a disappointment but it really doesn't bother me that much. I chose what I thought were my best works, using the standard of personal expression that I just mentioned, and I and the judges, whoever they were just didn't see eye to eye. But when you think you chosen your best work you don't change your mind because that judgment was not echoed by someone else. Particularly with juried shows things like this often happen. There could be a million reasons for rejection from any show. So my feeling is to always just choose your best work and then let the chips fall where they may. What is worse I think is to submit your work to a show you don't really like. I've done this for years for a show that I don't like. And I've never gotten in. This year I finally stopped applying because I realized I got angry every time I looked at the catalog of what did get in. I didn't like 90% of it, year after year after year. With SWLA it's far different. This is a show I like and admire. And I've never felt bad about submitting what I think is my best work to a show I like. If you're going to be rejected I personally find it much easier to deal with not getting into a show that I admire. Though I do have to admit it's always nice to get in the show. 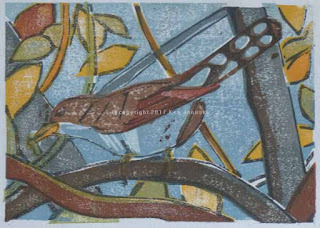 In any case both the SWLA experience and the Yellow-billed Cuckoo print represent what you might call ambition in art. You challenge yourself, a challenge that maybe only you understand and/or appreciate, but it is what makes all art, at least for artists, exciting! Artist sacrifice a lot for art, more than most people know. On the other hand it's not really a sacrifice, because most artists love what they're doing, even if it doesn't always end up with success or sales, and even if artists are not apt to publicly admit this. Finally there is a last motivation in my bird-based art: getting not just the shape, and sense of movement and life of birds, but also getting the subtlety of their coloring and plumage. Most wildlife artists spend far more time on this than I do. For me it isn't even very interesting, in either my work or the work of anyone else. I think this is mainly true because so often it is at the expense of any sense of life in the bird. It often seems to exhibit the skill of copying photos, not a very valuable skill in my book. 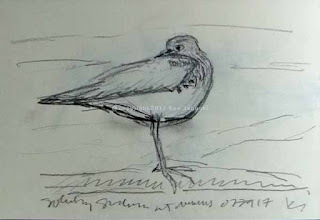 But sometimes you are just so struck by the beauty of a bird that you'd like to try to get it down on paper or canvas. Often such attempts end up lifeless but I do understand and appreciate the motivation. But that was not the case with the two watercolors below. 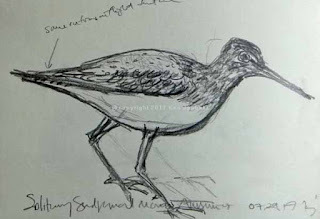 And this is something peculiar to wildlife art and especially bird art I think. I wanted to show some of the diagnostic characteristics of birds, the things that you might see in a guidebook. I rarely get into this in my art. But I do spend much of my time trying to identify birds and to differentiate similar ones from each other. So it's not surprising that occasionally I attempt to show that it my artwork. But it is a rarity for me, and though exciting when I do it, can be disappointing afterwards if it doesn't also show some sense of self-expression. As usual when you see shorebirds, especially if you're in a place like Philadelphia that doesn't really have all that many, there is the question of peeps. 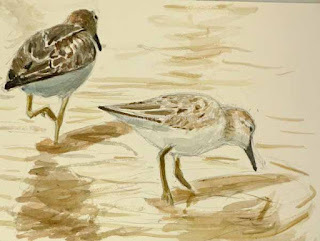 Are those small shorebirds Least Sandpipers, Semi-palmated Sandpipers, Western Sandpipers, something else? These questions were going through my mind as I looked at peeps recently and so I did these two watercolors, at least in part, to try to show the differences between the two. 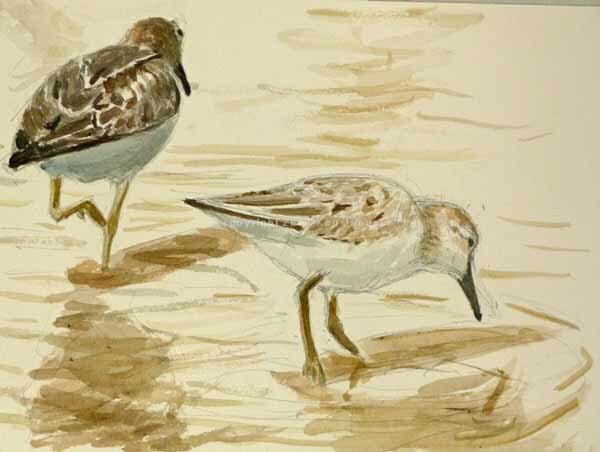 To some extent I've succeeded though I do think there is a little too much of the torpedo-like shape of a Red Knot in the solo Least Sandpiper watercolor. It is this desire to show something accurately which I think is most difficult for an artist like myself who comes from a 'Fine Arts' background. This type of almost scientific accuracy is just of no importance whatsoever in my training. In fact it's quite suspect. I would guess that my peers, at least at the time I was studying art in college, would have considered it an example of the most mundane and uninspired 'illustration', certainly not art. This is of course just one view of art and I have no idea how many people still subscribe to it. But I do think the fact that you never, ever see contemporary wildlife art in any museum show or contemporary art show indicates that this view still holds. So I personally find myself in an odd position. I abandoned the art world I'd grown up in because I think it had become thoroughly fatuous. All art was 'important' art, at least if you believed the galleries and art magazines about 20 years ago when I got fed up with it. So there are a million reasons I think to criticize contemporary art which has just as much of an 'academy' today as in the mid-1800s when the Impressionists reacted against it. I find the idea of working from nature, which has always had some importance in art, a good place from which to revive 'high art' to get it out of its thorough insularity and self-referentiality. So that's where I'm working. 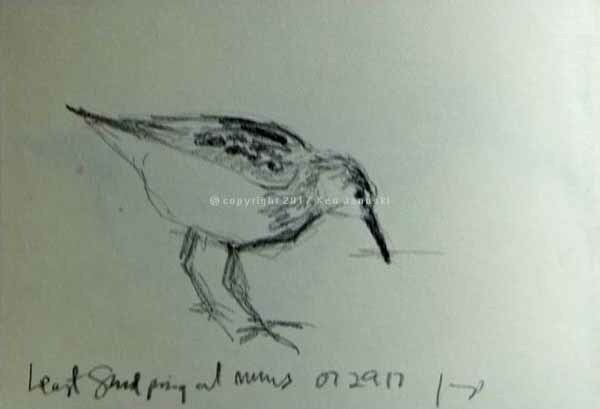 But I can't really see making art that is nothing more than illustration either, even if the subject is birds or wildlife. Art can be and has been so much more than that. So though there is some attempt at realism in the two paintings below I don't care in the least if I happen to miss one row of scapulars or any other such detail. That to me seems more the concern of a pedant than a artist. 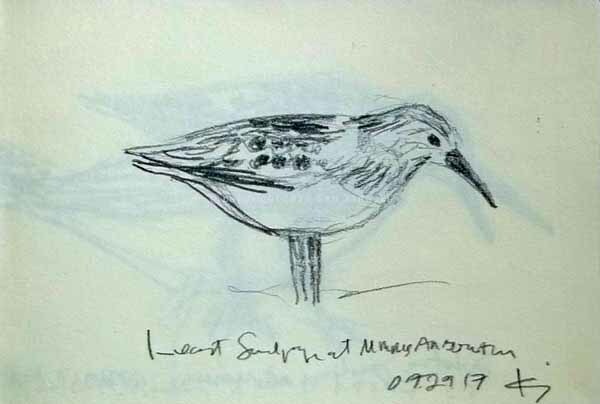 Least Sandpiper. Watercolor Painting by Ken Januski. 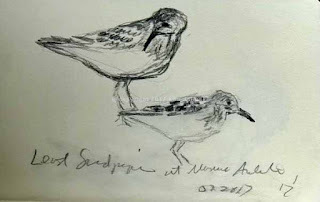 Least and Semi-palmated Sandpipers. Watercolor Painting by Ken Januski.